Whether you consider Christopher Columbus a hero or a villain, there’s one thing we can all hopefully get behind: some circa-1904 artistic images at the Columbus Circle subway station. 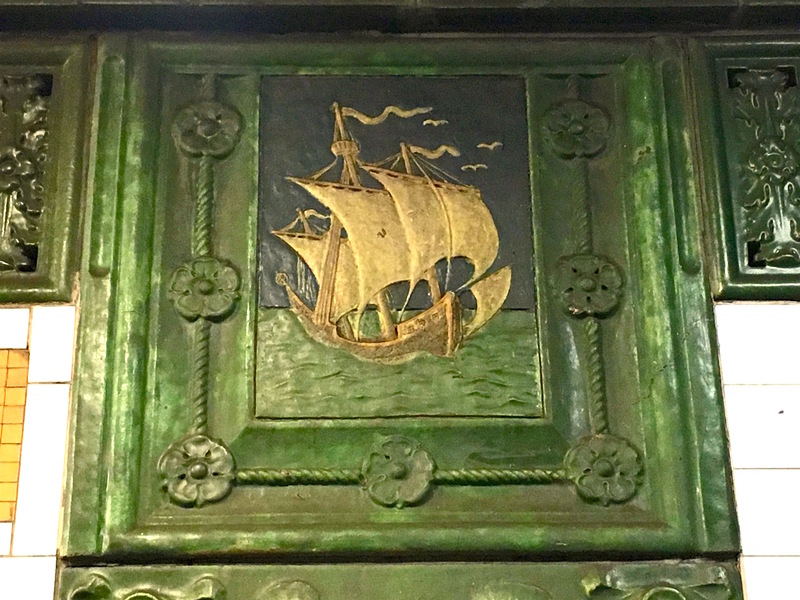 Behold the blue, green, and off-white faience plaques depicting the Santa Maria, the largest of the three sailing ships Columbus commanded on his first voyage in search of a shorter route to the Far East, according to this 1979 Landmarks Preservation Committee report. 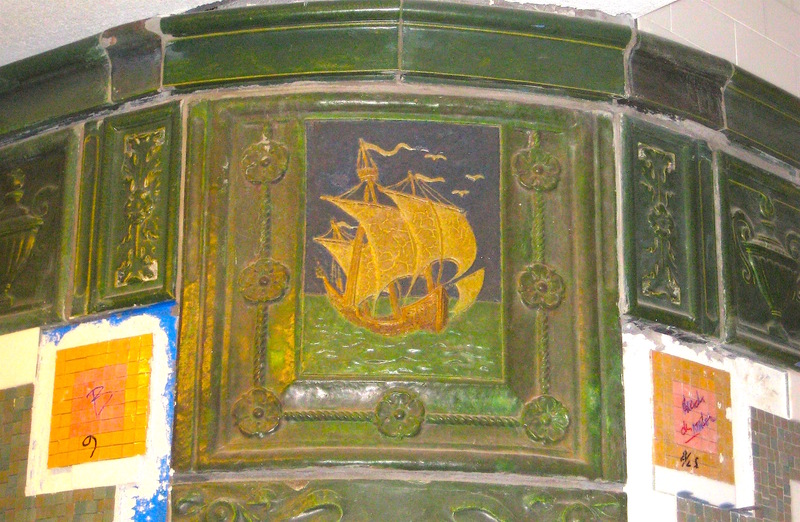 These restored sailing ship reliefs (the second image dates to 2011, as the restoration was in progress) line the platform of today’s 1 train, one of the original stops on the IRT that opened in 1904. City subway stops celebrate all kinds of nautical images—like at Fulton Street, where Robert Fulton’s steamboat is immortalized on the platform of the 4 and 5 trains. The makers of this postcard may not have realized it at the time. But they selected an image that gives contemporary viewers a glimpse at all the different transportation options available to New Yorkers in 1910. Trolley cars would continue at least through the 1930s. Horse-drawn wagons had another decade before they were banished to quiet side streets or out of the way neighborhoods. The automobile would soon dominate city streets. Pedestrians walk on what looks like a new sidewalk. And on the left, one of the original subway kiosks hint at the mass transit option of choice for city residents through the 20th century. Doesn’t New York become more magical in the rain? 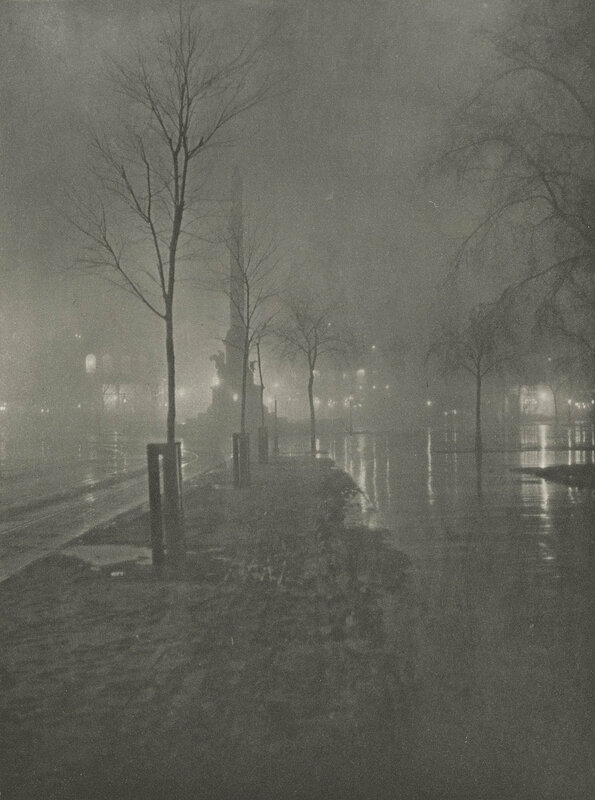 William A. Frazer, who took this enchanting photo titled “Wet Night, Columbus Circle” at the dawn of the 20th century, would likely agree. His image reveals the rainy nighttime city and marble Columbus monument cast in the soft glow of artificial light. When the photo was shot in 1900, electric streetlights extended up Broadway from 14th Street to the newly named Columbus Circle at 59th Street. More images of the growing city bathed in electric light can be found in The Gilded Age in New York, 1870-1910, on sale now. The traffic around the circle seems chaotic, and the fountains that surround it now wouldn’t come for another 80 or so years. 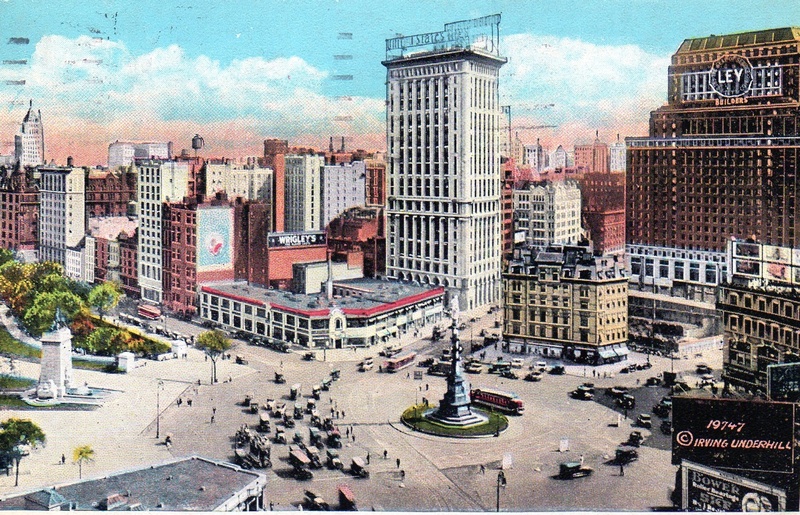 The yellow Victorian-looking structure in the center is the Pabst Grand Circle Hotel, torn down and replaced by the much-maligned Lollipop Building. Redone in the 2000s, it now houses the Museum of Arts and Design. I can’t figure out what the billboard on top of the white building says. United States something? 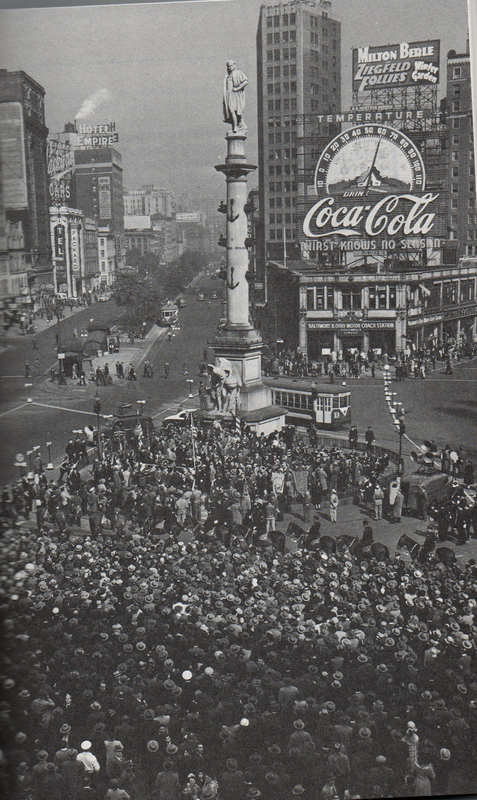 Columbus Circle had big, bright billboards and signage for decades. Okay, so it was no rival to Times Square. 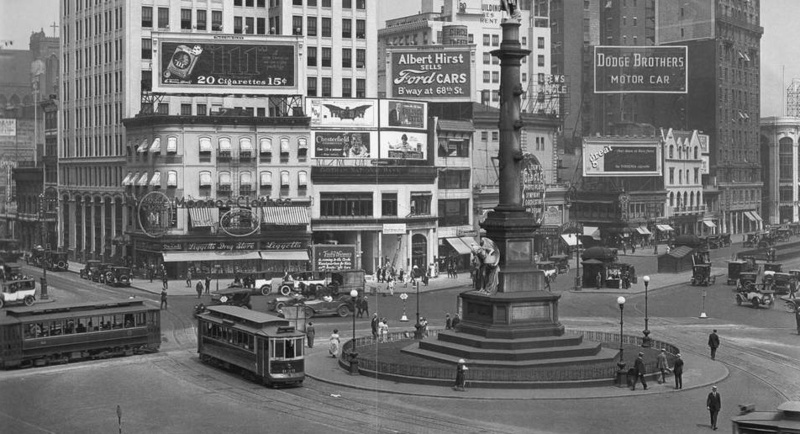 But in its 20th century heyday, the former Grand Circle (laid out in the 1860s; the Columbus monument didn’t arrive until 1892) boasted an impressive number of eye-catching signs and landmark billboards. 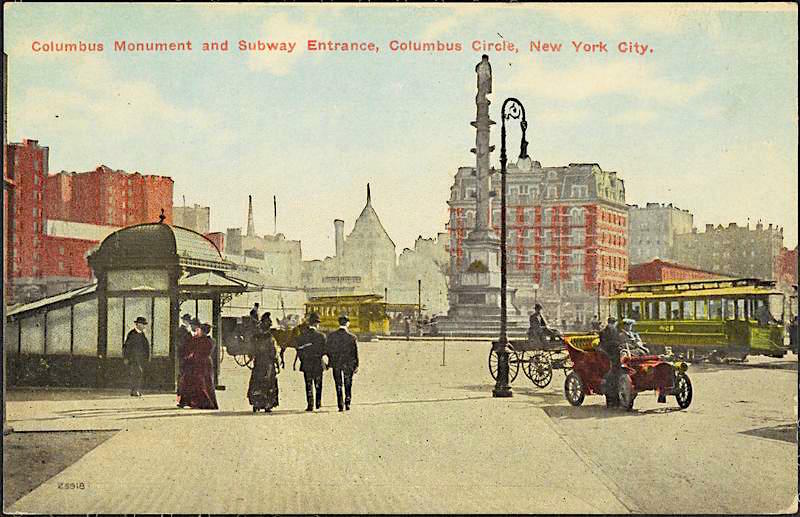 Here’s the West side of Columbus Circle in a 1907 Library of Congress photo, where the Time Warner Center is today. Ads for cigars, booze, and Uneeda Biscuits dominate. 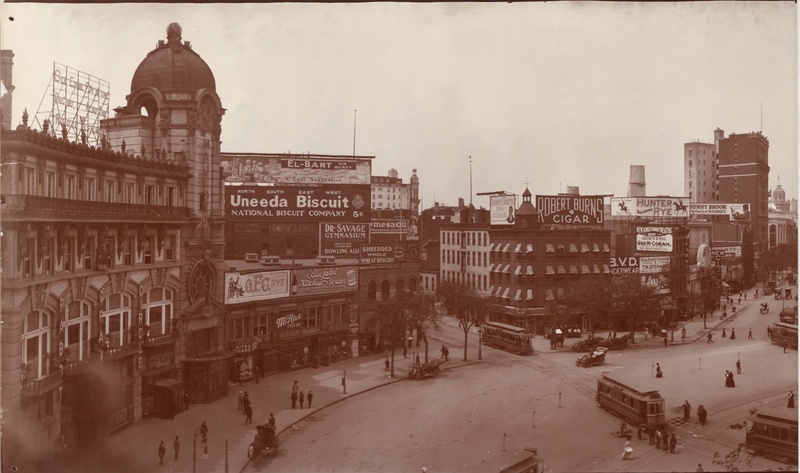 A slightly different camera angle in the teens or 1920s reveals more billboards: for cigarettes and cars. 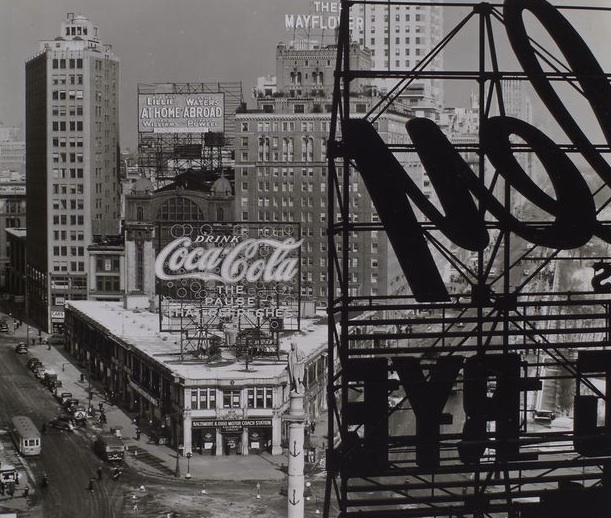 The famous Coca-Cola ad, photographed in 1938 by Berenice Abbott (through another alcohol ad), stood for decades until the building supporting it was bulldozed in 1966. The site then hosted the Gulf & Western Building, which was remodeled into the Trump International Hotel in the 1990s. On Columbus Day the previous year, 25,000 Italian-Americans came out to show their support for the Allies, and Mayor LaGuardia gave a speech praising their loyalty and urging tolerance of minorities, as Americans of Italian decent were considered back then.